M Karunanidhi burial Live Updates: DMK president and five-time Tamil Nadu Chief Minister M Karunanidhi's funeral procession enroute to Marina Beach where he will be laid to rest. 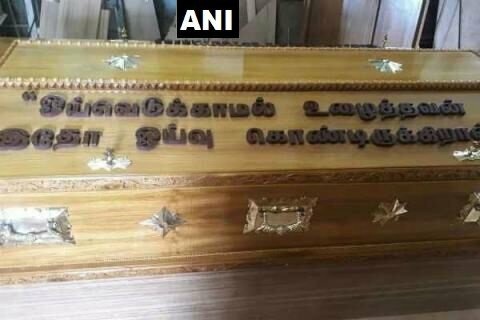 Karunanidhi burial LIVE UPDATES: DMK president?s buried next to Anna. M Karunanidhi death news Live Updates: DMK president and five-time Tamil Nadu Chief Minister M Karunanidhi’s funeral procession is en route to Marina Beach from Rajaji Hall. Over 1 lakh people and DMK supporters waving party flags have joined the procession that is moving towards the Marina Beach. At the burial ground, all preparations have been done and several DMK leaders have already reached the site where the Dravidian movement leader will be laid to rest. According to reports, Karunanidhi will be laid to rest at around 5 pm. The preparations at the Marina Beach began after the suspense over where the mortal remains of M Karunanidhi will be buried ended in the morning when the Madras High Court directed the AIADMK government to grant burial land for the Dravidian movement leader near the Marina Beach. Karunanidhi, 94, who had served as the Chief Minister of Tamil Nadu for five-time, died yesterday at 6:10 pm at Kauvery Hospital after prolonged illness. Meanwhile, two persons have lost their lives and over 30 have suffered injuries in a scuffle and stampede outside the Rajaji Hall. Karunanidhi’s son and DMK’s working president MK Stalin has blamed the state government for creating chaos and appealed to the party workers to maintain calm. Earlier today, people from different walks of life including Prime Minister Narendra Modi and Tamil superstar Rajinikanth arrived here to pay homage to the departed soul. READ MORE: Why Karunanidhi, born a Hindu, will be buried and not cremated? Madras High Court acting Chief Justice Huluvadi G. Ramesh agrees to hear by 10:30 pm today a case against denial of burial land by Tamil Nadu Govt at Marina beach for Karunanidhi. The Tamil Nadu government has refused permission to bury DMK patriarch M. Karunanidhi at the Marina citing "legal hurdles and several cases pending in courts." Instead, the government is ready to allot two acres of land near the Gandhi Mandapam on Sardar Vallabhai Patel road. Earlier, DMK Organising Secretary M. Durai Murgan told the media that they met Tamil Nadu Chief Minister Edappadi K. Palaniswami and requested the government to allow the burial of the former chief minister beside the memorial of his mentor C.N. Annadurai. Tamil Nadu has announced seven-day holiday in the state. Puducherry Government has also declared holiday on Wednesday and has announced three-day mourning. The MTC bus services have been gradually reduced in Chennai. However, the MRTS train services function as usual. According to reports, TASMAC shops have been asked to close down by 6 p.m. The Hindu report says that more than 5000 police personnel have been deployed across Chennai. A general alert has been sounded in the state following reports of deterioration in the medical condition of Karunanidhi. This afternoon, Stalin and Kanimozhi met CM EPS. Later, the CM held a high-level meeting with the officials of the state government to review the situation. Also, security has been enhanced at the hospital and the Gopalapuram residence of the nonagenarian leader. The KauveryHospital has issued a statement saying the condition of DMK president Karunanidhi is extremely critical. It adds that despite maximum medical support, the condition of his vital organs continue to deteriorate. Karunanidhi will be buried next to his mentor C.N Annadurai. The last rites are being performed at Marina. Kalaignar lays in rest after living a long life of 94. With the death of Karunanidhi, an era has come to rest. It is the end of an era. Top political leaders from across the country have landed in Chennai to pay homage to Karunanidhi's last rites. The funeral procession of departed DMK president M Karunanidhi begins from Rajaji Hall. The process will cover 3.8 kn long distance to reach the Marina Beach where his mortal remains will be laid to rest. 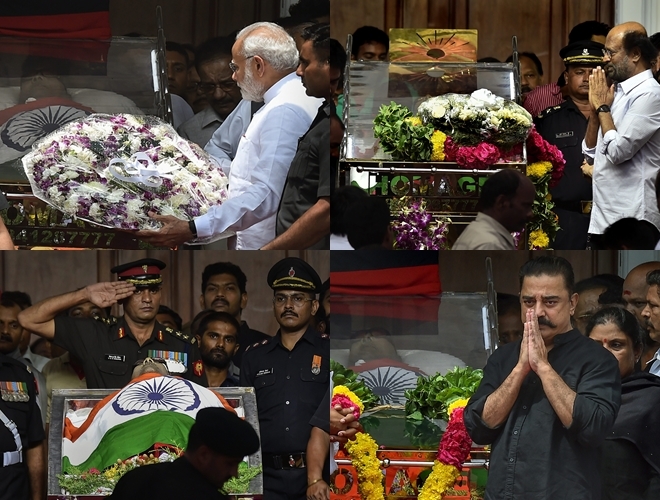 Prime Minister Narendra Modi and several Chief Ministers and political leaders paid tribute to late DMK chief M Karunanidhi at the Rajaji Hall in Chennai today. Karnataka Chief Minister HD Kumaraswamy, Kerala CM Pinarayi Vijayan, Telangana CM K Chandrasekhar Rao, CPI(M) general secretary Prakash Karat, former chief ministers of Kerala and Uttar Pradesh, Oommen Chandy and Akilesh Yadav respectively, among other leaders paid homage to the departed leader. TRS chief and Telangana Chief Minister Chandrasekhar Rao visited the Rajaji Hall to pay his last respect to departed DMK president M Karunanidhi. 2 people have been reported dead in stampede outside Rajaji Hall. DMK working president MK Stalin has appealed for calm. "Those who are in power are trying to create chaos, but you have all shown the strength of the cadres. I appeal to everyone to maintain peace," he said earlier. MK Stalin appeals to the crowd to remain calm. Addressing the gathering outside the Rajaji Hall, Stalin said that he wants to give a fitting tribute to the Kalaignar. "I request the cadre to remain calm, I did not want anything for myself. All I want is a fitting tribute to Kalaignar." 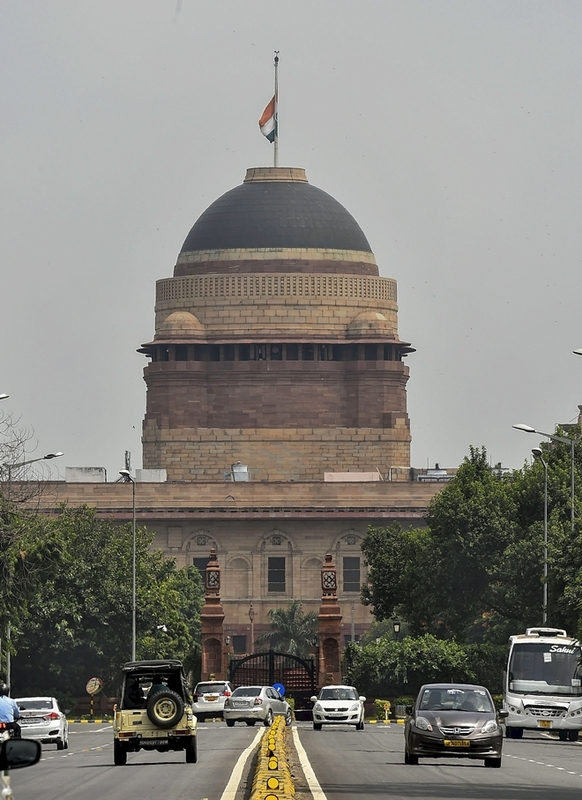 Indian national flag flies half-mast at Rashtrapati Bhavan in New Delhi after the demise of DMK chief M Karunanidhi. A clash between the DMK supporters and police broke out at the Rajaji Hall in Chennai where mortal remains of M Karunanidhi have been kept to allow people pay theirlast respect to the departed leader. Thousands of DMK supporters have thronged Rajaji Hall and Marina Beach to have a glimpse of their departed leader. At the Rajaji Hall, where Karunanidhi's mortal remains have been kept, police had to resort to a lathi-charge after crowd created ruckus and broke the barricade. The final journey of DMK president M Karunanidhi will begin at 4pm. According to tv reports, Karunanidhi will be laid to rest at 5 pm at the Anna Memorial along Marina Beach in the capital. UPA Chairperson Sonia Gandhi has written a letter to DMK patriarch M Karunanidhi's son MK Stalin. Describing Karunanidhi a statesman, she said, “We shall not see the like of Kalaignar again, and our nation is poorer without his wise statesmanship, and his dedication to our country and our people.” The Congress adds, “For me, Kalaignar's loss is very personal”. 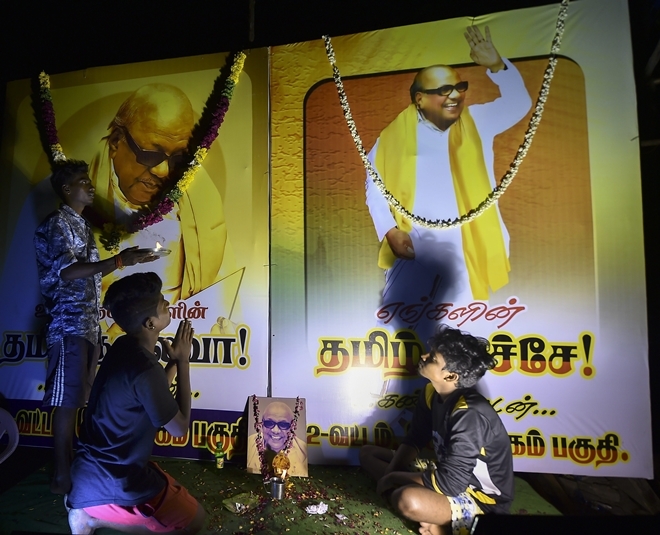 A pall of gloom descended on Thirukkuvalai, the native village of M Karunanidhi in the district, as soon as the news of his death trickled in. People started arriving in large numbers at his ancestral house. They paid floral tributes at a portrait of the DMK patriarch at his house. 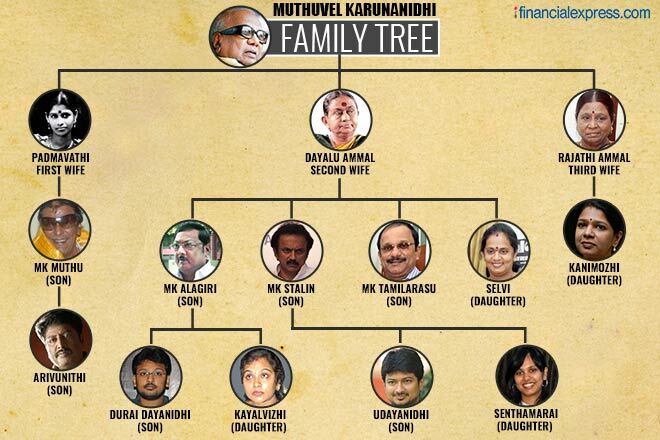 Karunanidhi was born on June 3, 1924 in the village and spent his childhood here. Situated in the heart of the village, his ancestral house -- a modest blue and white structure -- now houses a statue of his mother and two libraries named after his parents -- 'Muthuvelar Noolagam' and 'Anjugam Padippagam'. A huge collection of rare photographs of a young and vibrant Karunanidhi in various poses adorn the house now. DMK supremo M Karunanidhi had donated his residence at posh Gopalapuram locality in 2010 for setting up a hospital for the poor. On the eve of his 86th birthday, he had signed the gift deed donating the house to Annai Anjugam Trust, (named after his mother) to run the hospital after his and his wife's lifetime. The hospital to come up at the place would be named Kalaignar Karunanidhi Hospital, it was announced. "Just once shall I address you as appa (father)?" 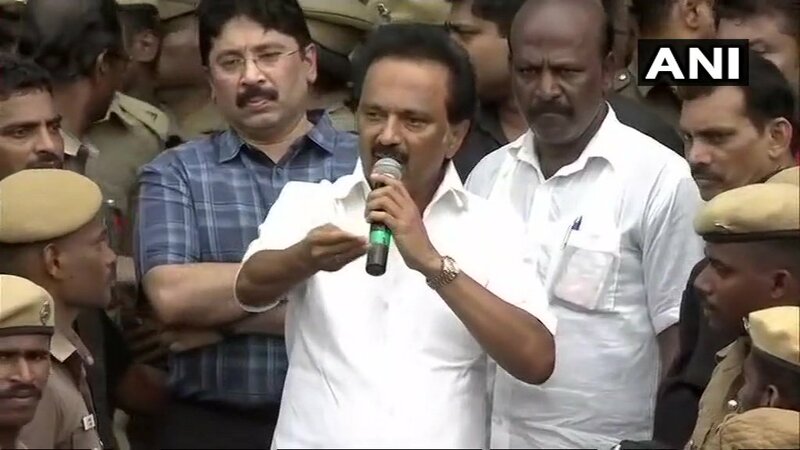 asked DMK Working President M K Stalin in a moving poem in memory of his late father M Karunanidhi, as he noted that he used to call him as 'leader' more often. "I have addressed you as Thalaivare Thalaivare (Leader) more than Appa Appa (Father). Therefore, just once, shall I address you as Appa, leader. Stalin said he used to inform him wherever he goes. "Why did you leave without informing this time." "Dear leader, who is intertwined with our thoughts and aspirations, where did you go leaving us behind." PM Narendra Modi who visited the Rajaji Hall earlier today, was seen walking with departed DMK president M Karunanidhi's son MK Stalin. 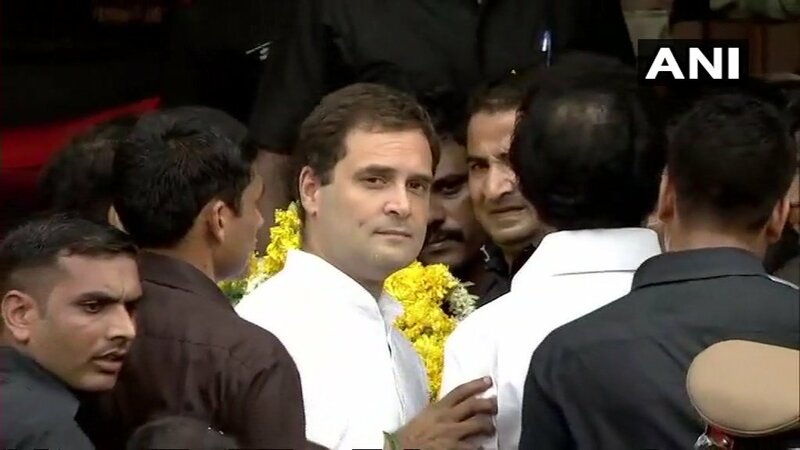 The PM arrived in the city ar around 11 am and headed directly to the Rajaji Hall where mortal remains of Karunanidhi have been kept to allow public to pay their repecte. TMC supremo Mamata Banerjee today said that she is happy that the Madras High Court has allowed the burial of DMK president Karunanidhi at the Anna Memorial along the Marina Beach. Speaking to reporters, Mamata said that she had yesterday visited the Rajaji Hall in Chennai to pay homage to the departed leader. She said: "I was unhappy yesterday, as the government did not allow the Marina beach burial. I had called the CM but he was unavailable. I also personally called the PM in this regard." 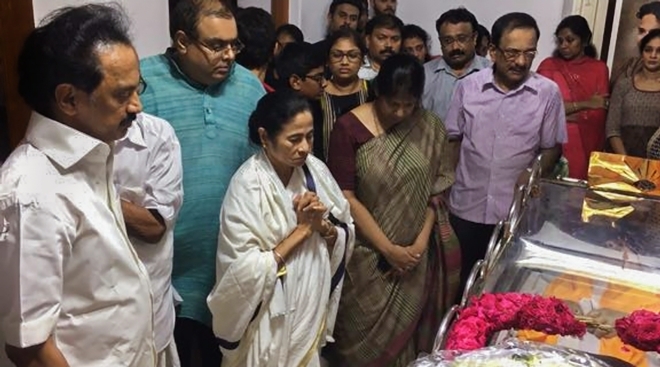 West Bengal Chief Minister Mamata Banerjee pays homage to departed DMK president M Karunanidhi at Rajaji Hall in Chennai. On Tuesday, Mamata had described Karunanidhi as India's one the greatest sons. She had tweeted: "Today India lost one of its greatest sons. And Tamil Nadu lost its father figure. Farewell @Kalaignar89. My deepest condolences to the people of Tamil Nadu and family. India mourns your loss. Both Houses of Parliament were adjourned for the day today after paying obituary to DMK chief M Karunanidhi who passed away yesterday. As soon as the Lok Sabha met for the day, Speaker Sumitra Mahajan informed members of the demise of Karunnidhi (94). Describing him as a "visionary" and a "leader of the masses", she said he spread his political philosophy through screen writing and produced some of the best hits in Tamil cinema. After observing a moment of silence in his memory, Lok Sabha proceedings were adjourned for the day. In Rajya Sabha, Chairman M Venkaiah Naidu, reading out an obituary reference, described Karunanidhi as a multifaceted personality and a gritty figure who overcame difficulties. After Madra High Court allowed Marina Beach burial for DMK patriarch M karunanidhi, a sea of DMK supporters have started gathering at the venue. The last rites will take place later today. The Congress party has questioned the 'silence' of the BJP government at the Centre and AIADMK government in Tamil Nadu over the Madras High Court's order allowing Marina Beach burial for Karunanidhi. In a tweet, Congress spokesperson Randeep Singh Surjewala said that the decision is a setback for 'proxy callers' sitting in Delhi for conspiring to deny a burial place at the Anna Memorial along the Marina Beach. V Kannadasan, DMK's lawyer, said that the Madras High Court accepted the DMK's plea for the burial of Kalaignar's body near Anna memorial. The court further directed Tamil Nadu government to ensure and establish a memorial for the departed leader. Prime Minister Narendra Modi today paid homage to DMK president M Karunanidhi at the Rajaji Hall in Chennai where the mortal remains of the department have been kept to allow the public to pay last respect to their leader. As soon as the Madras High Court passed an order allowing the burial of DMK patriarch Karunanidhi at the Anna Memorial along the Marina beach in Chennai, emotional DMK supporters erupted in joy as they welcomed the court's decision. The Madras High Court has allowed the Marina beach burial for departed DMK president M Karunanidhi. A High Court bench of Acting Chief Justice HG Ramesh and S S Sundar passed this order after hearing arguments of the both sides. The DMK had moved the HC last night after the AIADMK government rejected its request for allowing the burial of Karunanidhi at the Anna Memorial along the Marina beach. Karunanidhi was admitted to the ICU on July 28 following a dip in blood pressure. His condition was stabilised following medical intervention, but on Monday his health declined forcing the Kauvery Hospital to issue a statement. On Tuesday afternoon, his health declined further with doctors saying they were facing 'challenge' in keeping the leader's vital organs functioning. At 6:45 pm, the hospital issued a statement declaring that the DMK president is dead. He breathed his last at 6:10 pm.